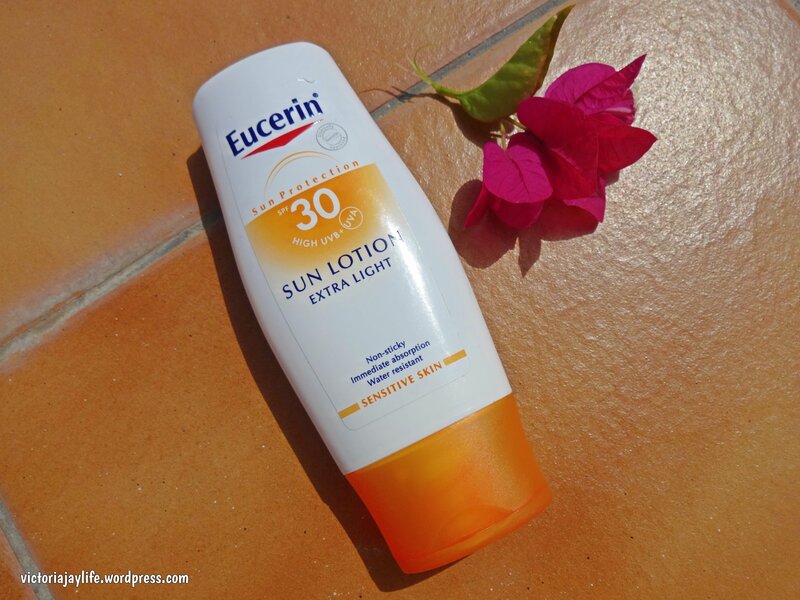 As I mentioned in my previous post reviewing Eucerin sun care (linked here), I am a long time prickly heat sufferer. I honestly don’t think it’s something I’ll ever be able to avoid completely, but over time I have picked up tips that either keep it at bay for longer, or make it more bearable when it does decide to make an appearance. I’m sharing my ‘top tips’ with you today! But first I should remind you I don’t claim to be an expert on any subject (as mentioned in by ‘about me‘ page). This means the information I’m sharing is simply coming from experience (although most of the time I’ve tried the tip out after reading up about it). I guess what I’m trying to say is, I don’t know if all of these the tips are backed up by medical evidence, but I do know they work for me! “Prickly heat, also known as miliaria rubra, is an itchy rash of small, raised red spots that causes a stinging or prickling sensation on the skin. Prickly heat usually develops when a person sweats more than usual, such as during hot or humid weather. Bearing this in mind the best way to prevent prickly heat? Avoid heat, humidity and sweating of course! However if you live in a warmer climate or enjoy your holidays on sunny shores that’s not always possible. Which brings me on to my ‘top tips’. You should of course talk to your doctor or pharmacist before taking any new medication but taking an antihistamine daily for 2-3 weeks before travelling to a warmer climate (and the duration of my trip) makes a difference for me. I don’t find it prevents prickly heat completely, but when it does appear it’s far less itchy and uncomfortable. This has been more of a recent realisation for me, but one that has made the biggest difference. As prickly heat is in part caused by the sweat glands becoming blocked, I found using a sun protection product with fewer ‘pore clogging’ ingredients made a huge difference on my most recent holiday. Namely these ingredients were Paraffin, Petrolatum and mineral oil. If, like me, you are sensitive skinned no matter the climate you might also find products low in or free from alcohol and perfume can help. I used Eucerin but as I only recently discovered this tip, I have no other recommendations I’m afraid! However, I found the post ‘Sense and Sensitivity’ from the blog ‘Get The Gloss’ an interesting read (linked here). Don’t forget to apply the same principles to your after sun! One of the things I hate most about getting prickly heat is missing out! While my fellow holiday makers might be frolicking on the beach all day, sightseeing for hours on end or laying by the pool from sunrise to sunset, I’m more likely to be the one hiding in the shade or going back to the hotel early as I just can’t be in the heat any more. However, I’ve found that spending a couple of hours in the middle of the day in a cool environment really keeps the prickly heat under some sort of control. A long lazy lunch in an air conditioned restaurant is my favourite way to do this. Or make like the Spanish and have a siesta in your room; have a cold shower, whack the air con up high, set an alarm and get into bed. You’ll then be refreshed for more afternoon fun and will have hopefully given your prickly heat a chance to recover. Chances are if you are prone to prickly heat, you also have generally sensitive skin. Well it’s logical to me anyway! And you know those showers you find next to every swimming pool? They are there for a reason! Jumping in the pool regularly is a great way to cool off but surely leaving the chemicals (and whatever else may lurk in the pool!) on your skin is asking for trouble? I now hop under the shower and give myself a good rinse after every dip in the pool and immediately feel the comforting effect on my skin. When I’m shopping, sightseeing or even exercising in the heat I obviously want to prevent sunburn. So as well as slapping on the sun cream I tend to cover up with more clothing compared to beach or poolside relaxation. But when I thought about it, if prickly heat is triggered by blocked glands, and I then cover those glands with a layer of clothing I’m bound to make matters worse. My fears where confirmed when I did some Googling but the NHS choices website recommends loose cotton based clothing, as natural fabrics are less prone to trapping heat. Dilemma solved then! 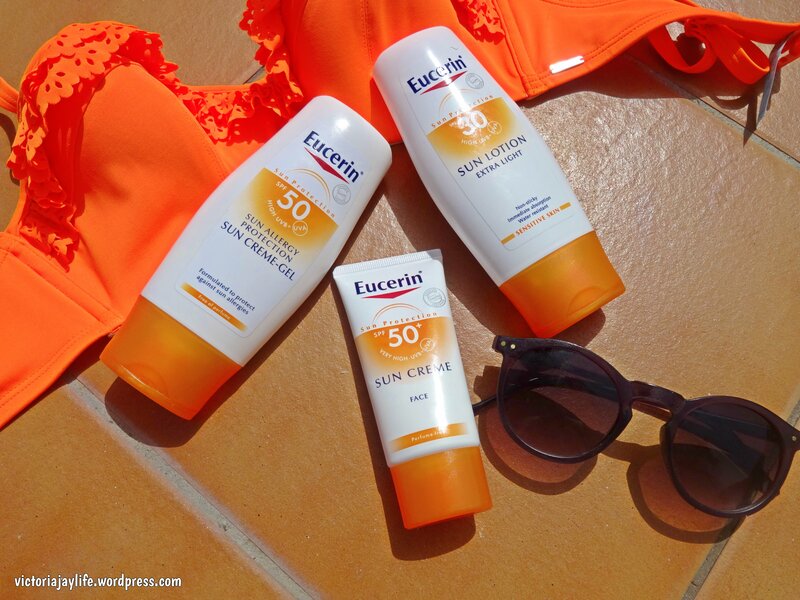 Eucerin Sun Care – a sensitive skin dream come true? Every time I go on holiday, I curse my sensitive skin. If you share this affliction but love the hot weather you will literally feel my pain. My complexion is fair, I’m very prone to prickly heat and also have skin conditions including eczema and dermatitis; not the best combination for pool side lounging! When a friend mentioned I should try a sun protection formula that doesn’t contain paraffin, it peaked my interest and I turned to Google for more information. Armed with a bit more knowledge I scoured the shelves in Boots for a product free from paraffin, petrolatum and mineral oil. These ingredients are likely to clog pores and aggravate allergies or prickly heat. I also wanted a perfume free or low perfume formula as I knew from experience heavily fragranced products and my skin do not mix well. 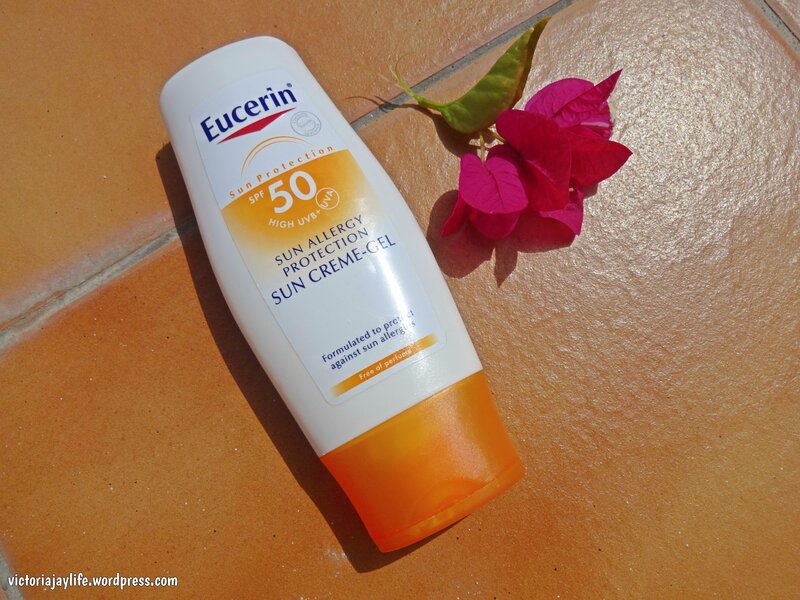 I found that a lot of brands or products claiming to be “for sensitive skin” or “allergy protection” contained some or all of the above ingredients so was pleased to come across Eucerin’s range as this ticked all the boxes. I bought three products, and used them on my recent 10 day holiday in a hot and humid climate. I loved them and won’t be going back to any other brand now. Read on to find out the specific products I used, how I used them and why I loved them! I use SPF 50 all over for the first few days of any sun drenched holiday, and continue with this high factor in the most sensitive areas for the rest of my time away. 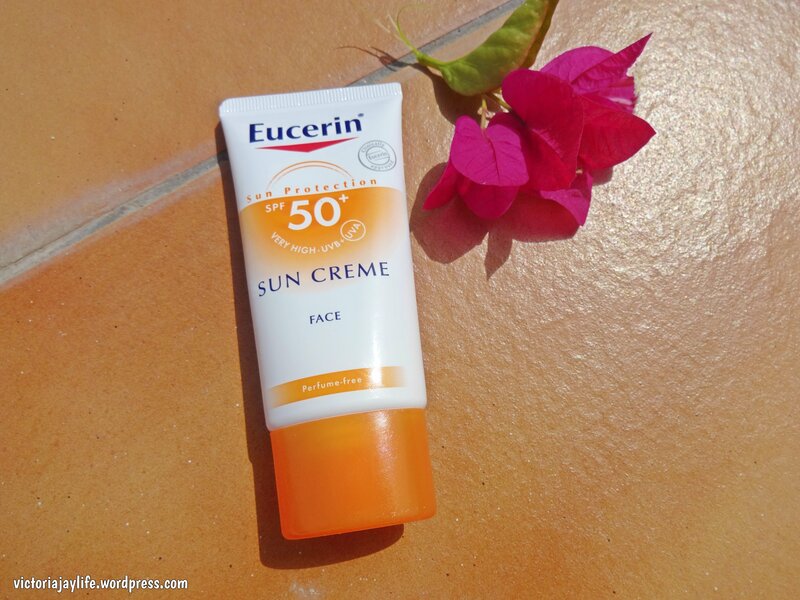 The formula of the creme-gel is reasonably thick, but I find the same with any SPF 50 product. Despite this it was easy to blend over the skin and absorbed really quickly. It left no white streaks or marks and I also found it to be really moisturising. When reapplied regularly, I didn’t burn. I’m also convinced it helped to prevent prickly heat as I ran out 6 days into my holiday and couldn’t purchase more where I was. I therefore had to buy something else and as soon as I switched, the prickly heat reared it’s ugly head! Any downsides? For me just the staining. In my experience, most sun protection products do tend to leave a yellow stain on light (especially white) clothing and I found this worse then most. However, for me the negatives are far outweighed by the positives. It’s also worth knowing despite the absence of the ingredients I’ve previously mentioned, I does still contain alcohol so may not be suitable for all sensitive skin types. After a few days in the sun without any reactions, I swap to SPF 30 on less sensitive areas. The formula of this lotion is exactly as claimed – extra light. This glides on so easily and a little goes a long way (although I always apply it generously just to be safe). This formula is free of paraffin, petrolatum and mineral oil but unlike the SPF 50 does contain perfume. However, it is the last ingredient on the list so not one of the main ingredients and as I only used in on my legs it didn’t cause me any problems. I was well protected with regular application and it did not cause as much staining to clothes as the SPF 50. I use SPF on my face all year round, and always SPF 50 for prolonged sun exposure. Thickness wise, this formula sits somewhere in between the sun allergy creme-gel and the extra light lotion. The ingredients list is very similar to the creme-gel in SPF 50. My face is definitely the most sensitive area and in the past applying any lotion to my face having spent a few days in the sun causes stinging or other uncomfortable feelings, but I had no signs of sensitivity with this. I did find this did not sink into the skin as well as the other two products so was prone to leaving a white cast over the face. This wasn’t a deal breaker for me as I wasn’t wearing any make up pool side, but I probably wouldn’t recommend it for an every day SPF to wear under make up for this reason. Overall, I was so pleased to find a product that enabled me to enjoy the sun without painful after effects. The brand is definitely priced at the higher end of the spectrum but worth every penny for me. It also appears to be on offer frequently, as I purchased during a ‘3 for 2’ promotion in Boots, and at the time of posting selected products from the brand have 25% off (again in Boots). Do you have any sun care tips for sensitive skin?